There is, however, a third class of magnetic materials called ferromagnetic materials. Such materials are characterized by a possible permanent magnetization, and generally have a profound effect on magnetic fields (i.e., ). Unfortunately, ferromagnetic materials do not generally exhibit a linear dependence between and , or and , so that we cannot employ Eqs. (866) and (867) with constant values of and . It is still expedient to use Eq. (867) as the definition of , with . However, this practice can lead to difficulties under certain circumstances. The permeability of a ferromagnetic material, as defined by Eq. (867), can vary through the entire range of possible values from zero to infinity, and may be either positive or negative. The most sensible approach is to consider each problem involving ferromagnetic materials separately, try to determine which region of the - diagram is important for the particular case in hand, and then make approximations appropriate to this region. continues to increase at large only because of the term. The maximum value of is called the saturation magnetization of the material. Next, consider a ferromagnetic sample magnetized by the above procedure. If the magnetic intensity is decreased, the - relation does not follow back down the curve of Fig. 48, but instead moves along a new curve, sketched in Fig. 49, to the point . Thus, the magnetization, once established, does not disappear with the removal of . In fact, it takes a reversed magnetic intensity to reduce the magnetization to zero. If continues to build up in the reversed direction, then (and hence ) becomes increasingly negative. Finally, when increases again the operating point follows the lower curve of Fig. 49. Thus, the - curve for increasing is quite different to that for decreasing . This phenomenon is known as hysteresis. 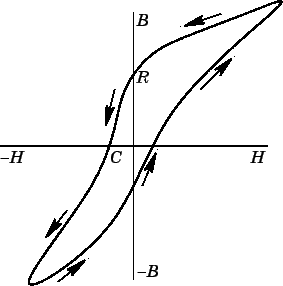 The curve sketched in Fig. 49 called the hysteresis loop of the material in question. The value of at the point is called the retentivity or remanence. The magnitude of at the point is called the coercivity. It is evident that is negative in the second and fourth quadrants of the loop, and positive in the first and third quadrants. 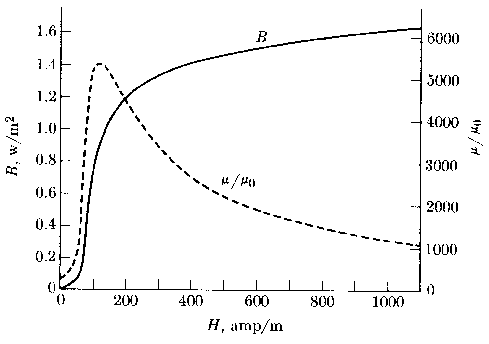 The shape of the hysteresis loop depends not only on the nature of the ferromagnetic material, but also on the maximum value of to which the material has been subjected. However, once this maximum value, , becomes sufficiently large to produce saturation in the material, the hysteresis loop does not change shape with any further increase in . Ferromagnetic materials are used either to channel magnetic flux (e.g., around transformer circuits) or as sources of magnetic field (e.g., permanent magnets). For use as a permanent magnet, the material is first magnetized by placing it in a strong magnetic field. However, once the magnet is removed from the external field it is subject to a demagnetizing . Thus, it is vitally important that a permanent magnet should possess both a large remanence and a large coercivity. As will become clear later on, it is generally a good idea for the ferromagnetic materials used to channel magnetic flux around transformer circuits to possess small remanences and small coercivities.